by Sarah - March 11th, 2014. 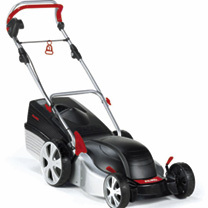 Ideal for anyone with a large lawn, the AL-KO Silver 470 E Premium heavy duty electric lawnmower provides the cutting power of a petrol mower, and has a useful mulching option. The height-adjustable, ergonomically shaped handlebar allows fatigue-free working and easy operation. Just mount the mulching insert and the machine works the finely chopped clippings into the lawn as a natural fertiliser. A fill-level indicator integrated in the grass catcher indicates when the catcher must be emptied so that the discharge channel remains clear. The spoked wheels reduce wear and tear on the lawn and feature quick individual wheel or axle adjustment to move the mower to the right height in a matter of moments. And compared to plastic decks, its steel deck is significantly more robust and insusceptible to knocks and stone impacts, and is easier to clean too! Cutting width 46cm. Cutting height 30-80mm, in 7 stages. Weight 30kg. 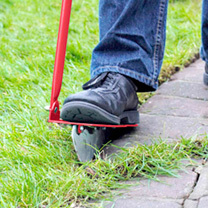 A speedy way to achieve the ultimate in lawn edging. 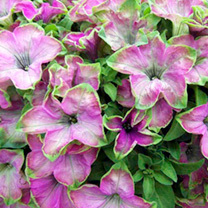 Ideal for edging patios, driveways and flower borders. Work without back or neck ache to create the perfect edge! Overall length 84cm (33). 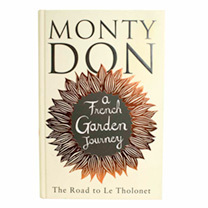 The story of a man travelling round France visiting a few selected French gardens on the way. Part travelogue, part treasure trove of historical anecdotes. Hardback – 304 pages. Striking white blooms with a contrasting cherry star. 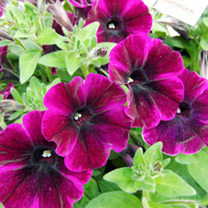 The semi-trailing plants are very free flowering and boast excellent weather tolerance. Height 25-50cm (10-20). 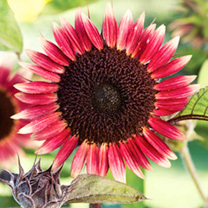 Vigorous, weather-tolerant plants smothered in rich, intense neon-coloured flowers with a deep purple star, set off against light green foliage. Height 25-50cm (10-20). 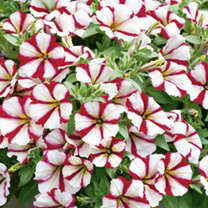 A semi-trailing petunia with fully double blooms that are a beautiful combination of cherry-red and white. Height 25-50cm (10-20). Trumpet-shaped flowers boasting a very unusual colour combination of rose-pink centres with an outer rim of deep lime green. Excellent weather tolerance, self cleaning and good mounding habit. Height 30-40cm (12-16). 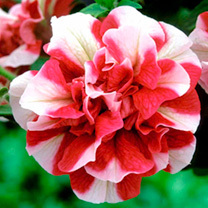 A vigorous, easy-to-grow species, which is quite hardy and blooms for months. Unusual seed pods. Height 1.8m (6′). Scent 1. (Please note: Each plug contains approximately 3 plants – although we recommend that you do not split them up when planting out.) Species & wild types – The original ancestors of our modern hybrids, which have been enjoyed for many generations! 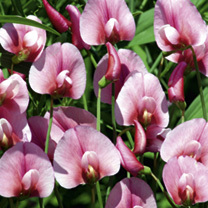 Sweet Peas – enjoy the most irresistible scented garden flowers this summer. « Order a bird box now!